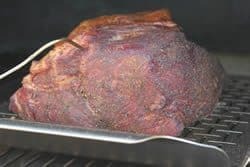 Smoked Beef Top Round – Smoky, Beefy, Delicious! 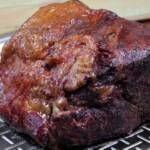 Home/Beef, Newsletter Archive/Smoked Beef Top Round – Smoky, Beefy, Delicious! 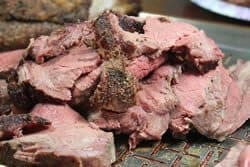 To make a large smoked beef top round in the 5-7 lb range like the one I recommend below, you'll probably have to speak to the butcher and get them to cut one for you. Most of the pieces in the meat department of your local grocer will be much smaller than this. 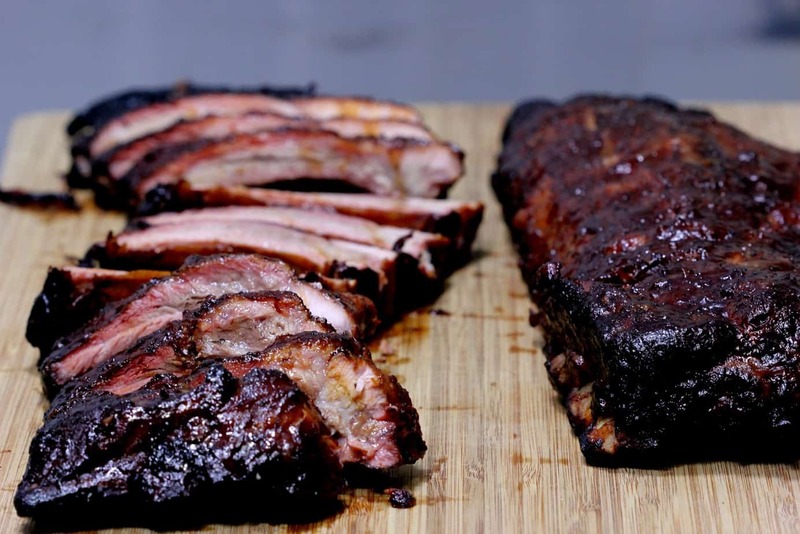 Season it up with my Texas style rub recipe (purchase recipes here) and smoke it until it reaches a perfect medium rare for delicious and smoky goodness that won't quit! In Texas, beef is king and often the only seasoning used is salt and pepper. 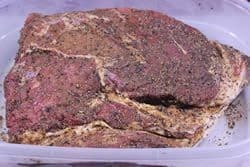 My Texas style rub recipe uses coarse ground black pepper, just enough salt and a few other complimentary ingredients to make the perfect Texas style rub that takes this smoked top round as well as any other chunk of beef to it's happy place. 6.5 lb top round ready to be brined/seasoned. To dry brine is to add salt to the outside of a piece of meat. 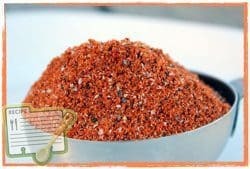 The salt draws out some of the natural meat juices which then mix with the salt and are drawn back into the meat. There's a lot of science involved but the main thing is that it works very well on large chunks of beef like this top round. My process is to coat the meat with my Texas style rub (purchase recipes here) first. 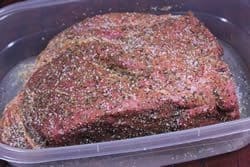 Then, because my Texas style rub recipe (purchase recipes here) has the right amount of salt to season but not enough to actually dry brine the beef perfectly, we add a little more coarse grained kosher salt all over. Place the top round into a large lidded container or a jumbo zip top bag and put it in the fridge during the brining process. Let the meat dry brine in the fridge for at least 4 hours but 7-8 hours is best. Remove the meat from the fridge and it is ready for the smoker. Because the meat is so big, the extra salt does not need to be rinsed off. Note: If you are concerned about it being too salty or you are trying to limit your salt intake, you can dry brine with salt only and then rinse it off under cold water once the brining process is complete. 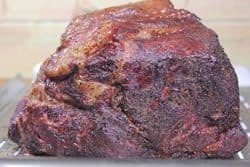 You would then add the Texas style rub recipe (purchase recipes here) to the outside of the meat to create a nice crust and to add some flavor to the meat. Set up your smoker for cooking at 225-250°F using indirect heat. If your smoker uses a water pan, fill it up with hot water or other liquid of your choice. 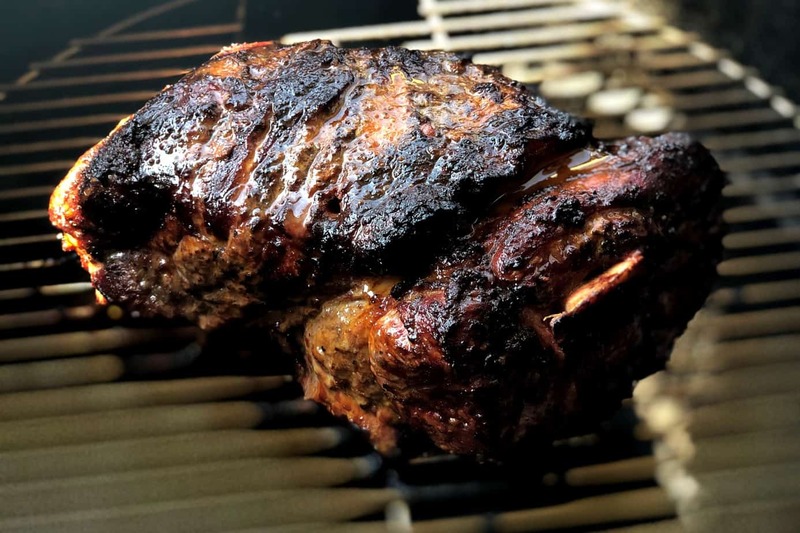 Once the smoker is ready, place the meat directly on the smoker grate or you can use a Weber grill pan or Bradley rack to hold it in the smoker and to easily move it back to the kitchen when it's finished cooking. Keep the smoke going for at least 2 hours if you are using a smoker that uses charcoal, gas or electric for fuel. I recommend oak for this smoked top round but any smoking wood will work fine. 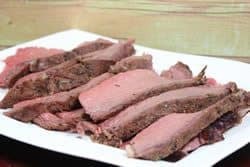 The cooking process should take about 4-5 hours to reach medium rare but may vary depending on your smoker, how often you open the smoker, the weather, meat thickness and even how cold the meat is when you place it into the smoker. 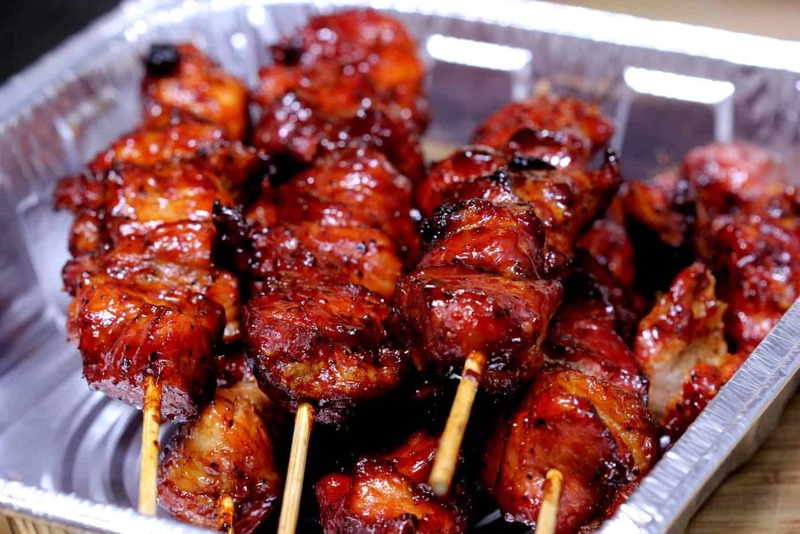 Be sure to use a digital probe meat thermometer that stays in the meat the entire time it is cooking. I use the “Smoke” by Thermoworks these days for accurate temperatures. 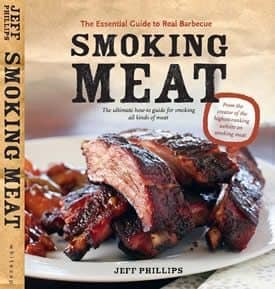 This allows you to keep the lid closed and still know when the meat needs to be removed from the smoker. If you want to use an instant read such as the Thermapen or the Thermopop, that will work well also. When the meat reaches about 137°F it has reached medium rare and is the best temperature in my opinion for eating this cut of beef. 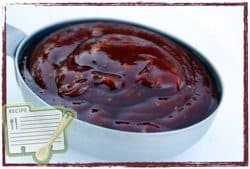 Bring the top round into the kitchen and set it on a cutting board, tent some foil over it for about 10-15 minutes to allow the juices to redistribute before slicing. Slice the meat across the grain and serve immediately. Serve like steaks with mashed potatoes, corn and green beans or you can slice it into thin strips for fajitas, tacos or even toppings for a salad. Smoked beef top round, like most beef, does extremely well in the smoker. It can be cut up like steaks or into strips for use on tacos, salads, fajitas, etc. Add more coarse kosher salt to the meat to help with the dry brining process. See picture in web version of recipe to estimate proper coverage. Place top round into lidded container and place into fridge overnight. 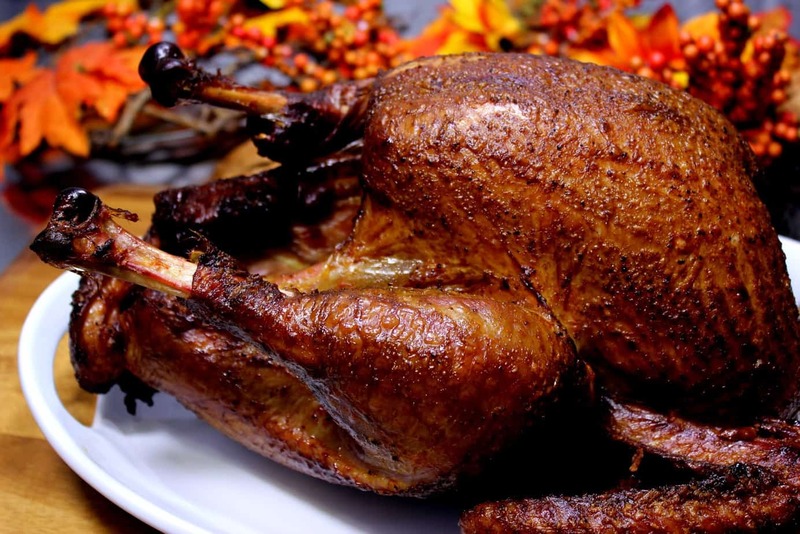 When the brining process is complete, remove the top round from the fridge and set aside. Set up smoker for cooking at about 225-250°F with indirect heat. Use oak smoke for best results but any smoking wood will work fine. Add smoke for at least 2 hours. When the meat is finished cooking, let it rest for about 10 minutes then slice into steaks or strips. Dumb question: When the recipe says to add smoke for 2 hours, that means 2 or 4-5 hours of the total medium rare cooking time, NOT an additional 2 hours, right? You are correct. This time is given for those who do not have wood or pellet smokers. It just means they can add wood chips/chunks for only 2 hours if they like. Longer is fine and more closely simulates a real wood smoker providing there is plenty of airflow into and out of the smoker. I have not cooked a top round of that size as most of them are cut into much smaller roasts of 4 to 7 lbs each. If I had one that size, I would definitely cut it up into at least 4 or 5 roasts so they would cook faster, be easier to slice, each piece would have more seasoning, etc. That much cold meat in the smoker is going to increase the cook time a little but probably not more than an hour or so at the most. Remember that time is just an estimate, the roasts are done when they reach your desired done temperature in the thickest part of the meat. I suggest medium rare or about 130 to 135°F maximum. Cook time is based on minimum thickness. My roast was 6.5 lbs and the minimum thickness was the distance from top to bottom which was an average of about 4 inches. 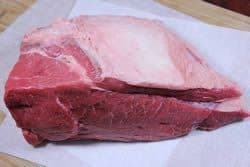 I would expect any top round roast of this equivalent size to take about 4 to 5 hours to reach medium rare if you maintain 225-250°F in your smoker. Amazing!!!! Even though I cooked it a tad to long it still was great! Smoked Beef Top Round -Outstanding. I got the butcher at the Farm Fresh to cut a 5 lb roast size hunk of the top round. I followed the instructions and the meat was absolutely perfect. 137 degrees after 4 1/2 hours gave us a juicy medium rare beef. Sliced thin, we’ll have great sandwiches for a couple days. Thanks!